In the event of an emergency you need to contact the emergency services. We are NOT an emergency service, but we will look after you when you get home! You may have noticed that General Practice is under pressure and we are finding ways to help. The latest figures show that in 2014, General Practice saw 40 MILLION more patients than it did in 2008, however there are no extra resources, in fact funding for general practice has been REDUCED. Across the country this is causing unprecedented difficulties accessing GP appointments. At Hughenden Valley and Chequers Drive Surgeries we have put into place and have access to a number of services to help you see the person best able to help you with your medical situation. You May Not Need An Appointment With A Doctor To Get The Help That You Need. The Choose Better Website is a really good place to start if you are not sure where to go. One of the greatest frustrations in General Practice, is found when someone waits for several days for a routine appointment, or even uses an urgent appointment for a medical problem that does not need to be seen by a GP at all. It uses up resources that could have been used by someone else and the person that went to the wrong place leaves feeling frustrated because they went to the wrong place! Should I attend my GP practice? The NHS has spent a great deal of time (and money) trying to encourage people to use the correct bit of the NHS for the problem that they have. This helpful guide shows where we fit into the NHS in General Practice, to help you decide which part of the NHS you should be using. At Hughenden Valley and Chequers Drive Surgeries we can help you with both of the green sections in this picture because we have two Practices and a dispensary. Please consider this chart carefully before you call to book an appointment. If you book a GP appointment because you have chest pain (red area) it could be unsafe for you. If you book a GP appointment because you have a sore throat (blue area) it could be unsafe for someone else that you know. There are simply not enough GPs in the UK for everyone to see a GP regarding every single medical issue that can occur. Locally, to help cope with this supply:demand imbalance, many services now allow what is termed "self referral". Please also consider the information below before booking a GP appointment. Click here for more information about medical problems you should take to show your Pharmacist and not your GP. Please respect the needs of your fellow patients by not booking an appointment to see a doctor just because you have a question about medication, for example after reading the list of side effects. Speak with your local Pharmacist. The practice were the first in the UK to develop and introduce 'POINT' - the "Pharmacist Opinion - In Need of Treatment" service. If you see a community Pharmacist, and then need to see a GP you will be given access to a FAST TRACK GP APPOINTMENT. For any problems relating to any of your medications, your first port of call should be YOUR COMMUNITY PHARMACIST. Do you think you might need a GP appointment but are not sure or just can't get an appointment? Since 2008 the number of appointments in General Practice has approximately doubled. At Hughenden Valley and Chequers Surgeries, we presently have enough appointments so that, if divided evenly, every single man woman and child can have an appointment approximately once, every single month. You may be surprised to learn that even though there is a widely publicised and desperate shortage of GP appointments nationally, many people still book appointments when they do not need to; for example, if they have a minor ailment. In just one day, for example, 14 'urgent case' appointments were used by people who had been stung by a wasp. The wasp itself remains at large. In the event of an emergency, a wasp sting needs to be managed by the emergency services. If it is not an emergency then a wasp sting should be managed by your pharmacist. In the extremely rare event of a wasp sting needing ongoing treatment, then your pharmacist will arrange for your GP to see you. At Hughenden Valley and Chequers Surgeries we pioneered a brand new service called POINT. The Pharmacist Opinion: In Need of Treatment service has been developed in collaboration with local pharmacy services and is designed to help those people that need to see a GP, see a GP! Simply present yourself to your Pharmacist with your health concern, and they will help you. It's that simple. 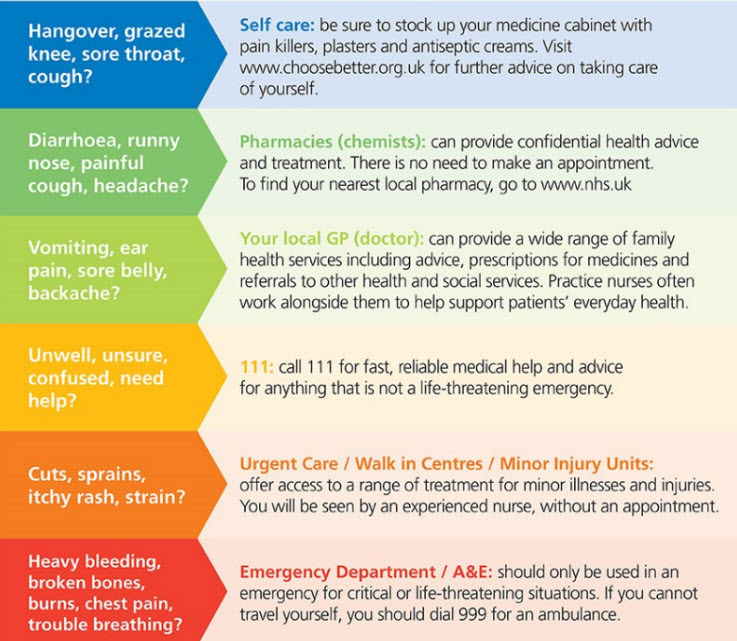 If you are not sure whether or not your problem is appropriate to take to a Pharmacist, you can find some information here: NHS Pharmacy Help, but if it's not an emergency and it's not already being looked after by a doctor, then it should probably go to a Pharmacist before you try and book a GP appointment. When you see your Pharmacist, if you need to see someone else about your health problem then you will be 'pointed' in the right direction by your Pharmacist. If, for example, you need to be seen at your GP surgery then you will be given a form (like the one shown here) to take to the GP receptionist who will arrange a fast-tracked appointment for you. The fastest way to get a GP appointment when you need one, is to see your Pharmacist. 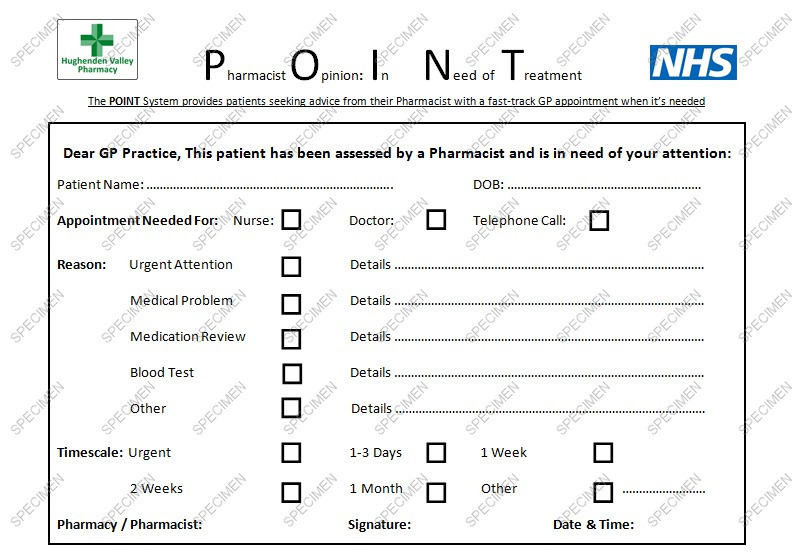 Pharmacies wishing to use this form may do so without charge. A generic version of the form (Microsoft Word Document) may be downloaded here: DOWNLOAD HERE on a PC / Mac. Dispensing patients may collect their medication from our dispensaries at both sites. We have professional trained staff to help with you needs and the clinical team should this be required. We process over 15,000 prescriptions per week and naturally there will be questions and queries that arise. Historically, these sorts of questions have been handled by doctors in the practice, however, with the ever-increasing demand for appointments in General Practice and ever increasing numbers of people on medications we have found that managing medication queries in this way can impact very heavily on the ability of everyone else to get an appointment. There have been days when almost no ill patients at all can get an appointment to see a doctor because of the huge numbers of patients who have a question about their medication. In a nutshell, there are not enough appointments in the day to allocate an appointment with a doctor to every person that has a question about medication. Please respect the needs of your fellow patients by not booking an appointment to see a doctor just because you have a question about medication, for example after reading the list of side effects. Not all medical problems are best managed by a GP. At Hughenden Valley and Chequers Surgeries we are able to offer a superb level of nursing care across both sites. For certain medical situations, you will be asked to see a nurse before you see a GP. Examples are practical procedures such as suture removal and dressing changes as well as a review in one of our chronic disease clinics such as diabetes or asthma. If you are seen by a practice nurse and need to be seen by a GP, you will be offered a FAST TRACK GP APPOINTMENT. We are also very fortunate to have a nurse prescriber service. Not all nurses are qualified to prescribe medication and not all GP surgeries have the service, but at Hughenden Valley and Chequers surgeries we offer Nurse Prescriber appointments in both surgeries. When you call to book an appointment, you may be asked to see a nurse, rather than wait to see a GP for your particular medical problem. If you are seen by the Nurse Prescriber and need to see a GP you will be offered a FAST TRACK GP APPOINTMENT. Some situations are managed better and more quickly by our Healthcare Assistant. If for example, you need an ECG or a review of your blood pressure, then you may be asked to see the Healthcare Assistant before you see a GP. If you are seen by a Healthcare Assistant, the results of your test may be reviewed by a GP immediately and if you need to see a GP you will be offered a FAST TRACK GP APPOINTMENT. Routine blood testing is not the very best use of our GP or Nursing appointments and so we offer a very high quality phlebotomy service. If you prefer to have your blood test undertaken at the hospital then this can also be arranged for you. This was one of our new pilot services that we have now introduced as a regular clinic at both surgeries. In a nutshell if your child is unwell then we will see them on the day. You will not be asked to call back because we have no appointments. The on the day Children's Assessment Service will be run by one of the GPs every day, (in addition to all of our usual services) and so you may be offered an appointment that is not necessarily with your usual doctor depending on the availability of appointments. This very busy service will give you a longer than usual appointment intended to address a range of childhood health issues. The specific issues discussed will depend on the age of the child. This is one of our new pilot services which we are testing this winter and we are pleased to announce that we appear to be one of the first surgeries to offer such a service. At Hughenden Valley and Chequers Surgeries we recognise that just because someone appears to be living independently, it does not mean that they do not need some level of support. Our VALIANT nursing team offers a bridge between being acutely unwell and "managing perfectly fine thank-you". This Welfare Community Nursing Role is in addition to all existing services and covers a very wide range of situations. Indeed, no two circumstances are the same. Liaising closely with your GPs as well as all other available teams, this practice-based domiciliary service is available to coordinate and oversee patient welfare for our most in-need patients. As a registered patients at with either of our practices, you will find that you have a named GP. You do not always have to see that GP, but we would encourage you to try and see the same doctor when you visit us. The Cardiac and Stroke Investigation Units (C.S.I.U) at Wycombe Hospital. 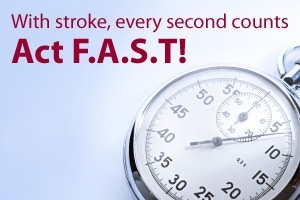 Located in the building formerly known as Wycombe A&E, this state of the art facility is there for those patients that are experiencing, or that may be experiencing, Heart Attack - or other serious heart related problems, or Stroke. YOU DO NOT NEED TO SEE YOUR GP TO ACCESS THIS SERVICE. Any delay could be extremely serious. If you have chest pain you should dial 999 and you will be advised what to do / what happens next. The Minor Illness and Injuries Unit (M.I.I.U.) at Wycombe Hospital. Located opposite the Cardiac and Stroke Investigation Unit (where A&E was situated), there is a minor illness and injuries unit. When you need to see someone for medical help at short notice, for example if you cut yourself, twist your ankle, or are feeling unwell; but its not an emergency, then this is the place to go. Its staffed by fully qualified GPs and Nursing Staff 24 hours / day. The unit will write to your GP and report what happened and also advise if any further management is required. You do not need to routinely book a GP appointment just to report that you were poorly and needed to go to the M.I.I.U. The 111 medical advice service. 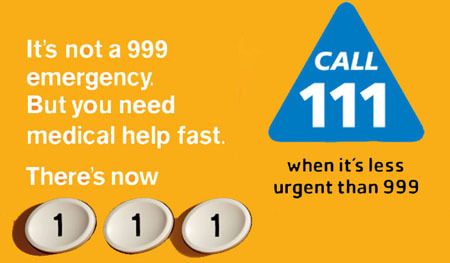 If you dont know what to do and if its not an emergency, dial 111. (if it is an emergency dial 999). 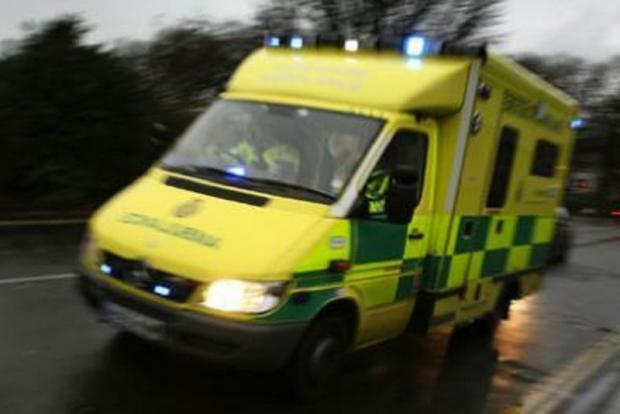 The Emergency Departments at Stoke Mandeville Hosital, Wexham Park Hospital, The Royal Berkshire Hospital and The John Radcliffe Hospital. 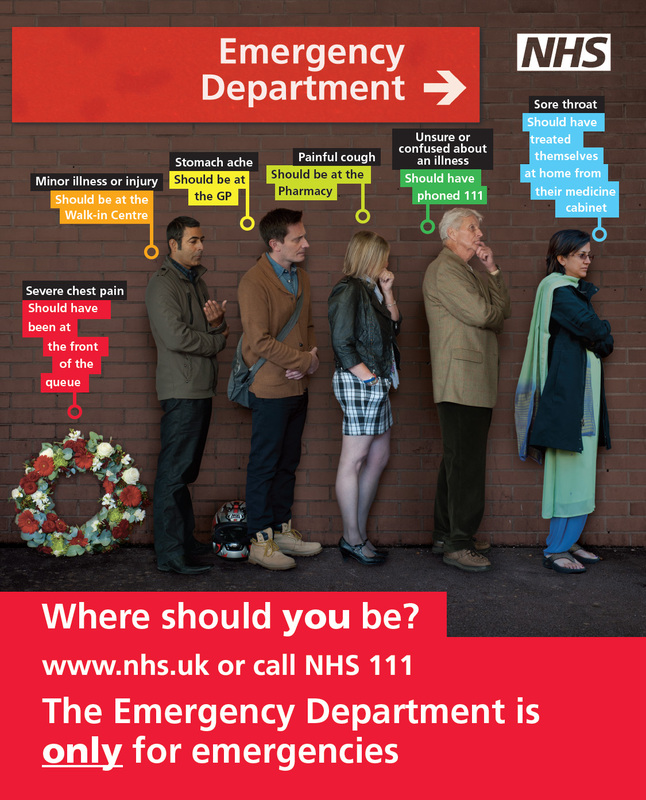 If you have an emergency, you should dial 999 or, if safe to travel, attend your nearest Emergency Department without delay. If you attend A&E when you do not have an emergency, you could cause serious harm.